Jeff Lange takes you on a trip back in time to celebrate Epcot’s 25th Anniversary. 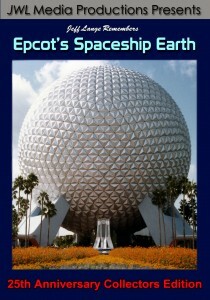 This first in a series, features the centerpiece of Epcot, Spaceship Earth. This incredible video was recorded with an audio mixer and two microphones to capture the sounds in front of you and the Walter Cronkite narration from the speaker behind your head. Experience the Home Computer, Telephone Network & Space Station scenes plus the “Tomorrow’s Child” ending. These were abstract animated overviews of the EPCOT Center attractions as viewed upon exiting the ride. A photo montage of vintage images from the original version of the attraction. Step into the AT&T corporate lounge for a brief tour. Enjoy the view out the large windows into the park towards World Showcase. Experience the updated narration and new scenes before paying a visit to the AT&T Global Neighborhood. Explore the progression of human communications from cavemen to the dawn of the Internet in this Siemens sponsored version of the attraction. Complete ride-through. This is the earliest ride footage available. Complete ride-through featuring alternate views of the ‘Tomorrows Child’ ending scenes. A final ride on the Future World classic sponsored by AT&T. Over 100 images spanning almost two decades of memories. Celebrate Epcot’s 25th Anniversary year after year or experience the magic for the first time by purchasing “Jeff Lange Remembers: Epcot’s Spaceship Earth” 25th Anniversary Collectors Edition 2-DVD Set!